I’ve decided to participate in a craft show this next Saturday, June 21st. It will be located in the Walmart parking lot in Brownsburg, IN. The entry fee proceeds are going to benefit the Children’s Miracle Network. This was a last minute decision so I’ve been busy this weekend getting stuff together. I’m planning on selling my beaded jewelry and stamped greeting cards. It is the first time I have participated in a craft show so it’s all new territory. I am making lists and checking them twice, but I just know that I’m going to forget something. If any one has any suggestions for me please email me. kandy@kandyskeepsakes.com In the mean time, here is one of my beaded bracelets. 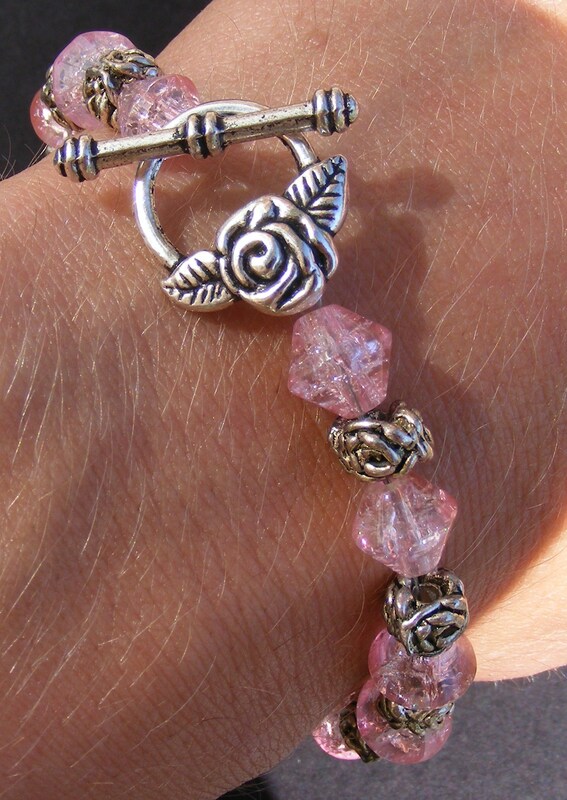 It is made with pink crackle glass and metal rose beads with a toggle closure. This entry was posted in Beaded Jewelry and tagged beaded, bracelet, glass beads, jewelry, metal beads, roses. Bookmark the permalink.